We were invited to take part in a singing workshop assembly at the Infant School to introduce the children to the fun of being in a choir! We all enjoyed doing our warm-ups and singing Early One Morning, Can You Feel the Love Tonight and Chattanooga Choo Choo, which we sang again as they filed out. A very heart-warming experience! The Impingtones gave voice at the Histon & Impington Community Orchard Project’s annual Winter Wassail in January 2019 to toast the trees (with actual toast 🙂 and have some fun on a winter’s evening!). Everyone had a great time with something out of the ordinary. We sang a couple of songs which, of course, included “I will Give My Love An Apple”! The orchard lies behind Somerset Road, or at the end of Saffron Road if coming from that direction on foot. Click here for music: Wassail Songs and HICOP Wassail Programme. Wednesday 12 Dec was party time! We made merry at the last session of the year with some carol singing gathered round a real piano! We arrived at the usual time of 6:15 to sing from 6:30 but this time in the Music Room at the back of the IVC (E18) for a special Christmas singsong followed by drinks and mince pies, finishing slightly later at 7.45pm. 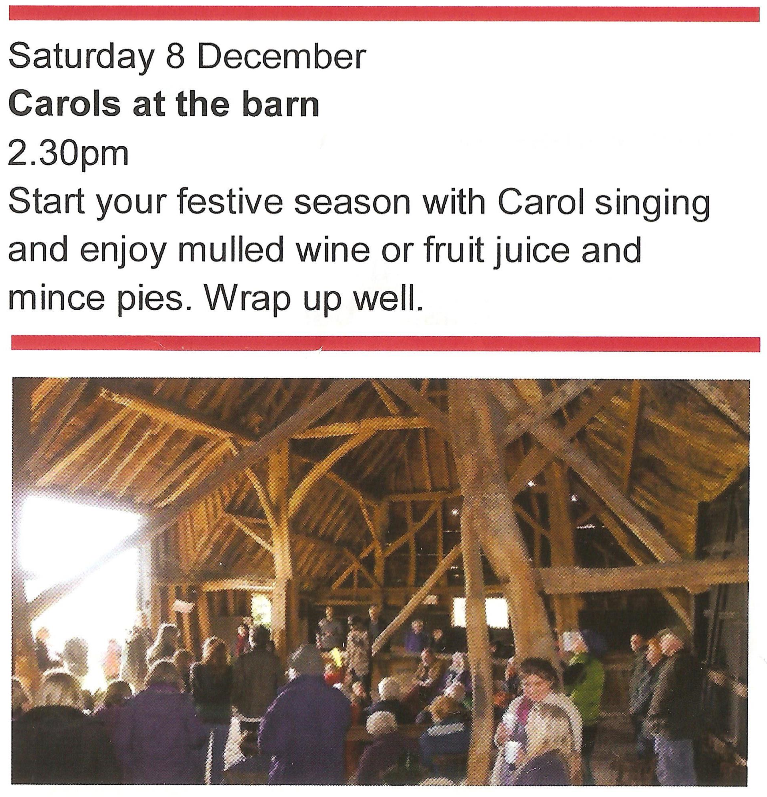 This was not an Impingtones event, but there was carol singing at the Tithe Barn at Landbeach with merry music, mince pies and mulled wine! Address: Opposite No 2. Waterbeach Rd, Landbeach CB25 9FA (follow the uneven grass track). Free road parking. 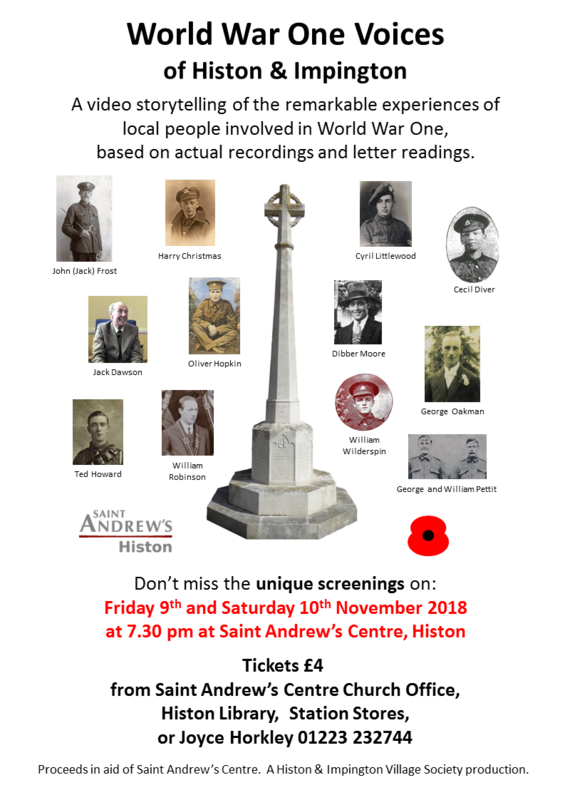 A remarkable storytelling of local people involved in the First World War from actual recordings and letter readings, including: going over the top at the Somme; the horrors of gas; the bizarre events on the Eastern Front in the Italian mountains; and so much more. And, of course, featuring some of our finest singers providing musical links to the narrative! This year’s autumn recital with Bridget Hardy (mezzo soprano) and Ralph Woodward (piano) was at 6pm on Saturday 20 October in the Unitarian Church on Emmanuel Road. A 45-minute programme of richly emotional songs by Vaughan Williams (Five Mystical Songs), Richard Strauss and Mahler (Lieder eines fahrenden Gesellen = “Songs of a Wayfarer”), with free sparkling wine served from 5.30pm. We had a lovely members evening get together in the Red Lion from 6:30pm to start off the new term. The Manor Mill Morris team performed and the Red Lion laid on a Beer Festival especially for us! Wednesday 11 July – an event with Drinks and Nibbles for Family and Friends! Trevor Lee Photography kindly created a brief video of the event for the website, which can be found on the Performances page. Bridget Hardy (mezzo soprano) and Ralph Woodward (piano) will perform a short recital of delicious songs by Parry, Bernstein, Copland and McEnery at the Unitarian Hall, Emmanuel Road, CB1 1JW. Tickets: £10, £5 (students) from ralphwoodwardtickets@live.co.uk or phone 07711 384218 . Bridget’s Monday choir Singing Allowed performed a free concert of songs from their varied repertoire at the Castle Street Methodist Church in Cambridge to which we were all welcome (their last concert was very good!). Refreshments available after the performance and there was be a retiring collection for charity. This was set to music by Benjamin Britten in 1934 from the words of a Walter de la Mere poem for children based on text dating back to 1849. It’s origins are from a Welsh New Year’s Day tradition of sprinkling people with water newly drawn from a well. The term “Levy Dew” is likely from the Welsh “llef y Dduw” (the ‘f’ in Welsh is pronounced ‘v’) meaning “cry to God”, though some suggest it may have French roots. The Fair Maid is possibly a reference to the Roman goddess Aurora, who bears the gold of the sun rising on her head (or possibly chin 🙂 ) and setting on her feet (and toe!) – but that might be stretching it a bit. See: Levy Dew in Wikipedia. Saturday 20 Jan 4.30pm – Histon & Impington Community Orchard Wassail ! Just to let you know that HICOP are planning their annual wassail on Saturday 20th January at 4.30pm at the Community Orchard. The wassail involves singing to the trees to encourage them to bare good fruit in the coming year (well, worth a try!). We are not planning to sing as a choir at this wassail but may consider it for 2019. The Meadows Community Centre is on St Catherine’s Road at the top of Arbury Road (and is part of Impington from the pre-A14 boundary). 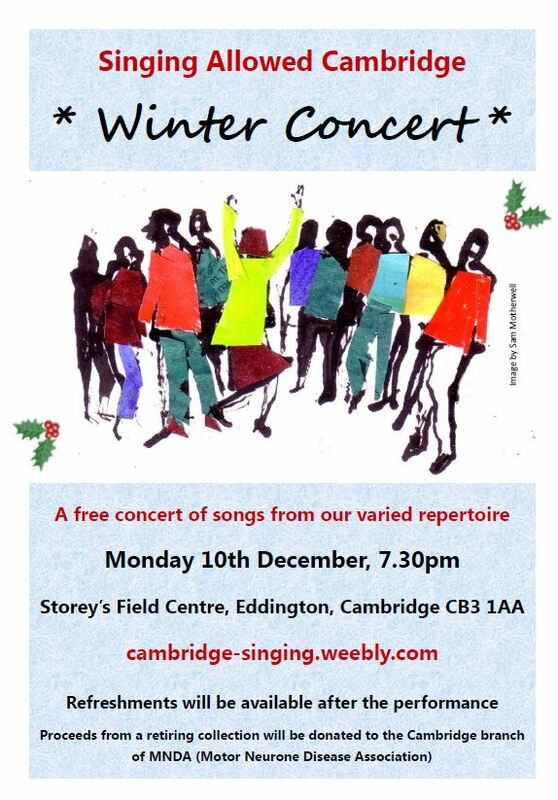 Bridget’s Monday choir Singing Allowed are performing a “free concert of songs from our varied repertoire” at the Castle Street Methodist Church in Cambridge to which we are all welcome (can’t believe they’re up to our standard but do go along and find out! 🙂 ). Refreshments available after the performance and a retiring collection will be donated to The Rainbow Trust Children’s Charity. Whoopee ! … it’s the Impingtones Summer BBQ on Saturday 15 July from 6pm at Sue’s house. There’s no need to bring anything … apart from your music folder as we intend to have a little sing-song! But don’t worry, Bridget will be there to guide us and there’s honestly no pressure to take part if you would rather not. Please feel free to bring a friend, relative, partner, colleague, etc if you would like. We do need to know numbers in advance so please complete the Doodle Poll below. Please include both your name and that of anyone you are bringing (you will need to enter the poll twice to do this). Saturday and Sunday 24/25 June – Impington Gardens! We have booked a tour of Cambridge for the choir, through Cambridge Tour Guides www.cambridgetourguide.co.uk. Our blue-badge guide, Tony Rodgers, will bring the city to life with stories about its past. The tour meets at the Tourist Information Centre on Pease Hill (alongside the Guildhall) at 6:30. Places are limited to 20 so please book as soon as possible via the doodle poll here. The cost is £5 per person (to be paid later). Do add your name to the list even if there are already 20 people, as we’ll keep a reserve list and organise another tour. Concert in aid of Disasters Emergency Committee.